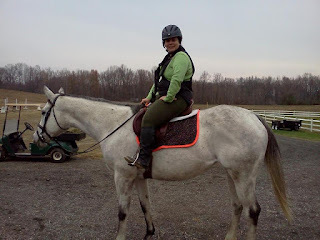 A Fat Girl & A Fat Horse: Guest Blog: "You're too fat to ride"
Our guest blog today is written by Bernadette who writes Green Bean Express, go on over and have a read! Five years ago, almost six now, I decided that for my 30th birthday I was going to do all of those things that I had always wanted to do as a child, but due to geographic limitations and financial constraints I never had an opportunity to do; riding and fencing. Fencing I hated. Riding, on the other hand, I knew was going to be opening up Pandora's box as I have always loved horses. I started riding shortly after Christmas and the weather around here can be oddly bipolar; one day it can be 70 and sunny and the next it can be 20 and snowing. Now, dairy barns I know having grown up in dairy country. Horse barns, on the other hand, I knew little to nothing about so I had no earthly idea of what I was looking for in a good barn. I did my research and the facility I found seemed to be on the up and up so I signed up for their Introduction series. If I only knew then what I know now......During my 4th lesson I was placed on a horse that had never actually been through a training program. The owner just purchased him and threw him into the lesson program (again, I did not know this until later). It was a cool 35 degree night and the wind was hallowing through the indoor. We were working on learning to post and, well, said horse decided that he had had enough of what I was doing and decided to pick up his canter down the long wall in the arena. Did I mention this was my 4th lesson? You can see what's coming can't you? Not only did I come off, but I came off in a blaze of glory; hitting the ground, knocking the wind out of me, and scaring the bejesus out of me in the process. I got my lungs back, picked myself up, caught the horse, got back on, and finished my lesson. Dammit, I paid for the time and I was going to get my time. After the completion of the lesson the instructor held me back and said to me, "You are too fat to ride. You should really think about taking up a different hobby." Say what?! Now, I will fully admit that I am fluffy. I will also admit that I have struggled with my weight my entire life to include some time as a bulimic when I was in the service and struggling to conform to their weight standards. At that time I was down 70 pounds from my heaviest weight (now it's a bit more). On top of that, I will proudly declare that I am half the size of my mother and I work every day to increase that margin. However, she didn't know any of that. All she saw was a big girl. Needless to say, among other reasons, I dropped that barn and found a new instructor. Five years later I am still riding. I work my rear end off in the gym, on the metro, heck even at my desk doing things that I know are going to improve my riding. My entire body shape has changed because of my riding and I feel the best about myself I have felt ever. Am I still green, yes. Could I still stand to loose weight, yes. Am I still working on it every single day, oh heck yes, especially now. Why now? As of St. Patrick's Day 2012, this girl who was too fat to ride got her very own pony. Oh yeah, and she is a big girl too! An 16.1hh OTTB named Cora who is built like a warm blood and hates caloric expenditure (which is probably why she didn't make it as a race horse). She and I are on a journey together, one calorie at a time. What a delightful start to your riding career, thanks for sharing. Kay. Great Story and I bet your happy you stuck at it. Love the fact you bought a grey, my fav. oh, and you really dont look like a big girl at all!! Too fat my bottom - I am so very glad you ignored that idiot and did what you wanted and kept on going! You are beautiful and so is your horse. I am so glad you didn't let one person be the end of your horse journey. You are an inspiration! I fear hearing what you did hear so hence I have never gotten any lessons- except from a VERy dear friend of mine who is also 'fluffy'. Very gorgeous mare, i am very happy that you have stuck it through! I wanted a 16HH quarter horse preferably a gelding but I have ended up with a 17 Hand spotted draft - she's the love of my life- but I still ride my old appy gelding at 15.2 hands no one has dared say anything to this 'fluffy' rider being on him! GREAT blog entry! I'm so glad you didn't give up your dream of riding! You're a beautiful gal and so is your horse! Keep up the good work!! Good for you! Hope you keep it going - lovely mare! I can completely understand where you are coming from. 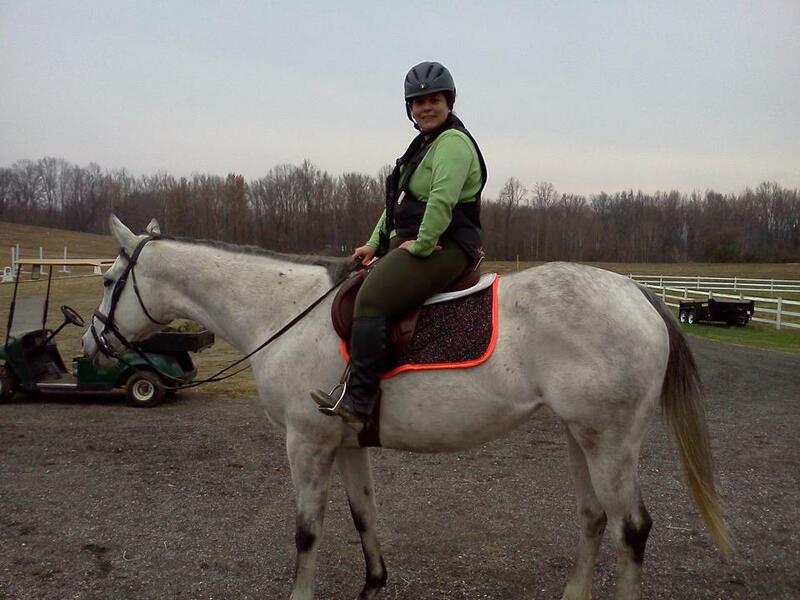 After being rejected one too many times from riding instructors I placed an ad in a local horse community forum where I posted my weight-thought it best to be open from the start. I was contacted by a lady who had a 17.2hh Shire mare, trained to Level 2 Dressage. Since then I've become immersed in horse craziness-I have had up to 4 as a rescue had a baby. Recently I sold my lovely 17.1hh Belgian mare as I was diagnosed with an autoimmune disease and just dont' have the energy for 3 horses. I have my beautiful Suffolk Punch/BelgianX, and a cranky old Hanoverian who is the official barn lawn ornament. Heartfelt congratulations on your lovely new horse! You look like a great team! What a jack wad of an instructor! Glad you got out of there. There's nothing wrong with riding if you're heavy so long as you find an appropriate horse to do it on. Sheesh! Congrats on getting your own horse and moving on past what was just plain rude criticism. Thank you all so much for your kind comments. I've been incredibly lucky to be surrounded by instructors (since this incident) who are positive. They tell me, "You can be heavy in the saddle even if you weight 110 pounds." So I work VERY hard on being light in the saddle, and work my arse off in the gym in addition to riding 6 days a week. The only way that you get healthier is by moving. Hooray for you! Well done. People are so cruel :( Im sorry you had to go through that. I ride western now because I feel that the western community is so much kinder and forgiving. I'm a Wellness Coach for Herbalife. I'm proud of all of you who choose any form of exercise! As a fellow, albeit novice, equestrian, I can attest to the fact that horseback riding is an excellent all encompassing form of exercise! If you need any help with your nutrition or fitness needs, please do not hesitate to contact me! My email is donnarez@earthlink.net and my web-site is listed below. I'm happy to share my story and weight loss journey with you, and help you with your own goals! Thanks and keep up the GREAT work!